An opaque deal with a Chinese company is both business as usual and cause for political scandal in Kyrgyzstan. What should a pair of pliers cost? Questions like these are at the heart of an ongoing parliamentary inquiry in Kyrgyzstan on the recent contentious modernization of a power plant in the capital. The hearings, which were occasioned by a cataclysmic breakdown at the plant in January, have revived a political scandal that is threatening to engulf a raft of top officials from a previous ruling administration and are raising questions about the nation’s relations with China. Bishkek thermal power plants, or TETs, as it is known universally in its Russian-language acronym, keeps the city habitable. As well as providing electricity, it also pumps heated water into apartments. The Soviet-built facility dating to the 1960s had long been in need of a spruce-up, however. It was only in recent years that there was any firm progress on the renovation. China’s government would lend large sums of cash to fund it, but with one catch. Beijing would get to choose who would do the work. A precedent for this model was set by a project to build the Datka-Kemin high-voltage power line, which joined power grids in the north and south of Kyrgyzstan in 2015. The state-run Exim Bank of China lent $389 million — at 2 percent annual interest to be paid back within 20 years — and the work was done by a company called Tebian Electric Apparatus (TBEA). When the line was completed, TBEA began to look around for other contracts in Kyrgyzstan’s energy sector, which is how the TETs deal happened. The parliamentary inquiry on TETs that began on May 10 has a few broad goals. One is to understand specifically how the modernization contract was doled out. Another is whether shortcomings in the work are what caused the breakdown in January that left around 200,000 homes heatless for about five days just as temperatures outside had dropped to almost -30 degrees Celsius (-22 Fahrenheit). Among the people summoned to give testimony in parliament were the recently fired prime minister, Sapar Isakov, and two former occupants of that office, Jantoro Satybaldiyev and Temir Sariyev. All were somehow involved the TETs reconstruction initiative. Much of the indignation has centered on the fact that the government not only appears never to have considered alternative contractors to TBEA, but that it even rejected other options out of hand. The contract was not put out for tender. Lawmakers have heard how another Chinese company, China Machinery Engineering Company, or CMEC, had offered to do the same work for $30 million cheaper. Blame for this is being placed at the feet of Isakov, a 40-year-old whose rapid rise through the ranks ended with an even-more rapid fall last month, when he was fired as premier by lawmakers. In one of his jobs before being appointed prime minister in August 2017, Isakov was the presidential administration’s point-man on foreign investments. Speaking in parliament, Isakov said it was the Chinese government that had demanded TBEA be exclusively granted the TETs contract and that no credit would be forthcoming otherwise. “There is a lot of inaccurate information around about [supposed] lobbying for this agreement. The choice of TBEA was the official position from China and we could not change this. They sent three notes to our department informing us of this. My task was to forward this position to the president,” Isakov said. MPs are not entirely convinced by this explanation and point to other related issues, such as the fact that the loan deal does not designate Kyrgyzstan as a sovereign entity but a private party. Should any legal dispute arise, it will not be resolved at a diplomatic level or in an international tribunal but in a Hong Kong court. And then there is the matter of Kyrgyzstan’s mounting debt pile, which the TETs loan has done little to resolve. The loan came to $386 million. Within 20 years, Bishkek will have to pay back $480 million, accounting for interest. Proponents of the modernization are exasperated by such arguments, reasoning that the loan was offered at highly preferential terms and that the government would not otherwise have been able to afford urgently needed work. Satybaldiyev, the former prime minister who signed the modernization deal with TBEA in 2013, said that his government actually managed to negotiate $10 million off the initial estimate. Nurlan Omurkul uulu, who headed the TETs from January 2017 until his dismissal following the plant breakdown this year, takes issue with irregularities in the preparation for the renovation and with how money was spent. “There was no project design as such before the modernization. The design was developed in parallel [with the modernization work], which is something that the Chinese company got permission to do from the government. The personnel that was responsible for overseeing the work could not do it to absolute satisfaction, because they had no documents to use as reference,” Omurkul uulu told Eurasianet. Omurkul uulu has emerged as perhaps the most persistent gadfly of the modernization’s defenders. Immediately after he was fired, he caused considerable outcry by going public with documents showing the exact amounts TBEA paid for various items and services. There were pliers bought for more than $600 and fire extinguishers costing $1,600. 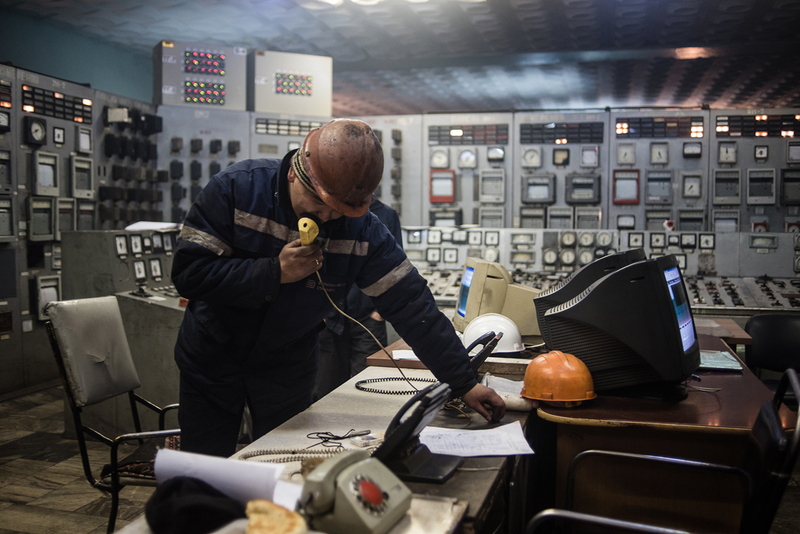 Electrical Stations is a company one notch higher up from TETs in the hierarchy managing Kyrgyzstan’s power-generating facilities and runs several similar plants across the country. When Omurkul uulu first raised the outcry about the budget breakdown, the company was sanguine, saying the final cost was justified by all the high-tech specifications. “For $386 million, we get video cameras for use at high temperatures in the power plants’ boiler rooms. For $386 million, we get pliers suitable for industrial use. The entire project cost $386 million,” Electrical Stations said in a statement. So why did the plant break down? Officials at the time insisted it had nothing to do with the renovation. That project consisted in part of replacing eight old boilers with two new ones. Another eight old aging boilers remained in place, however. When the malfunction occurred, six old boilers and one of the new boilers were knocked offline, dramatically limiting operational capacity. Water pumped out of the facility dropped from its normal 80 degrees Celsius to around half that temperature. Omurkul uulu said that TBEA failed to build an additional chemical unit for pre-processing water to be pumped through the boilers, as required. The absence of that unit meant water was not coursing through the system at the required levels and that this may have been the cause of the malfunction, he said. “I have kept seven or eight letters and meeting memorandums where it is specifically stated that we need to build a chemical unit. But they only began to build it in the summer before the accident happened, and now, for some unknown reason, they have halted construction,” Omurkul uulu said. A number of people, including several top officials at Electrical Stations, were detained in the wake of the plant breakdown. They face charges of embezzling funds allocated for the 2017-18 heating season. But MPs are demanding that prosecutors, the State Committee for National Security, or GKNB, and the Audit Chamber investigate further. And this is where the whole affair is becoming intensely political. Many of the former members of the elite seemingly in the potential crosshairs are individuals that have at one time or another served under former president Almazbek Atambayev, who ended his only permitted term in November. The former president and his successor, Sooronbai Jeenbekov, are long-time associates and ostensibly allies, although a decided chill has descended between the pair in recent weeks. This disaccord stems in large part from Jeenbekov’s relentless efforts to root out Atambayev’s stay-behind cronies, whom the incumbent appears to see as a check on his authority. Isakov, the point-man on foreign investments under Atambayev, has twice been summoned by the GKNB for questioning over the TETs affair. He has not been charged with any offense. After his second session of questioning, on May 14, he told reporters cryptically that he had while in office “shielded” Jeenbekov, who was himself prime minister until August, when he declared his run for the presidency. “If we are to be entirely fair, they should question everybody who signed agreement documents. And that includes everybody who approved the ratification immediately in three readings. And those who were not scrupulously vetting the implementation process, putting proper controls in place,” Isakov said. According to former MP Omurbek Abdyrakhmanov, who was one of only seven legislators to oppose the TBEA deal in 2013, it is his former colleagues who are the biggest culprits. Nurjamal Djanibekova is a Bishkek-based journalist.